Apart from wall-mounted solutions and hooked bars on uprights, our range also includes a new vertical self-supporting model of cold cut hanger, which can be easily relocated inside the delicateness. Available in the 14-bar version and in the 26-bar version. 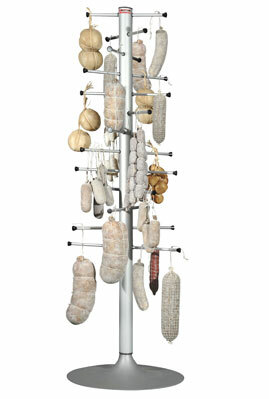 Cheap and versatile, it is suitable to hang up cheese, salami, ham and anything else, according to your needs.